This is an extract from Disaster Alley: Climate change, conflict and risk published recently by Breakthrough. Climate change is an existential risk that could abruptly end human civilisation because of a catastrophic “failure of imagination” by global leaders to understand and act on the science and evidence before them. At the London School of Economics in 2008, Queen Elizabeth questioned: “Why did no one foresee the timing, extent and severity of the Global Financial Crisis?” The British Academy answered a year later: “A psychology of denial gripped the financial and corporate world… [it was] the failure of the collective imagination of many bright people… to understand the risks to the system as a whole”. A “failure of imagination” has also been identified as one of the reasons for the breakdown in US intelligence around the 9/11 attacks in 2001. A similar failure is occurring with climate change today. “A proliferation of ‘unthinkable’ events… has revealed a new fragility at the highest levels of corporate and public service leaderships. Their ability to spot, identify and handle unexpected, non-normative events is… perilously inadequate at critical moments… Remarkably, there remains a deep reluctance, or what might be called ‘executive myopia’, to see and contemplate even the possibility that ‘unthinkables’ might happen, let alone how to handle them. Such failures are manifested in two ways in climate policy. At the political, bureaucratic and business level in underplaying the high-end risks and in failing to recognise that the existential risk of climate change is totally different from other risk categories. And at the research level in underestimating the rate of climate change impact and costs, along with an under-emphasis on, and poor communication of, those high-end risks. An existential risk is an adverse outcome that would either annihilate intelligent life or permanently and drastically curtail its potential. For example, a big meteor impact, large-scale nuclear war, or sea levels 70 metres higher than today. Existential risks are not amenable to the reactive (learn from failure) approach of conventional risk management, and we cannot necessarily rely on the institutions, moral norms, or social attitudes developed from our experience with managing other sorts of risks. Because the consequences are so severe — perhaps the end of human global civilisation as we know it — researchers say that “even for an honest, truth-seeking, and well-intentioned investigator it is difficult to think and act rationally in regard to… existential risks”. Yet the evidence is clear that climate change already poses an existential risk to global economic and societal stability and to human civilisation that requires an emergency response. Temperature rises that are now in prospect could reduce the global human population by 80% or 90%. But this conversation is taboo, and the few who speak out are admonished as being overly alarmist. 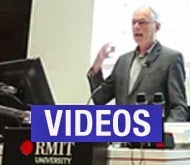 Prof. Kevin Anderson considers that “a 4°C future [relative to pre-industrial levels] is incompatible with an organized global community, is likely to be beyond ‘adaptation’, is devastating to the majority of ecosystems, and has a high probability of not being stable”. He says: “If you have got a population of nine billion by 2050 and you hit 4°C, 5°C or 6°C, you might have half a billion people surviving”. 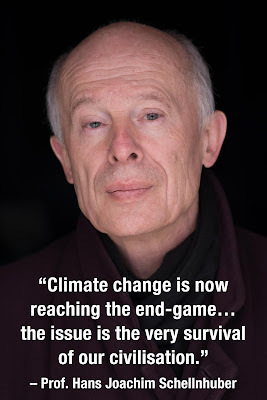 Asked at a 2011 conference in Melbourne about the difference between a 2°C world and a 4°C world, Prof. Hans Joachim Schellnhuber replied in two words: “Human civilisation”. 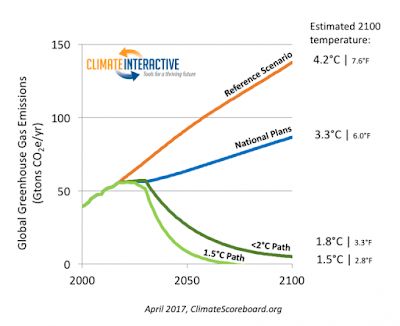 The World Bank reports: “There is no certainty that adaptation to a 4°C world is possible”. Amongst other impacts, a 4°C warming would trigger the loss of both polar ice caps, eventually resulting, at equilibrium, in a 70-metre rise in sea level. The present path of greenhouse gas emissions commits us to a 4–5°C temperature increase relative to pre-industrial levels. Even at 3°C of warming we could face “outright chaos” and “nuclear war is possible”, according to the 2007 The Age of Consequences report by two US think tanks. Yet this is the world we are now entering. 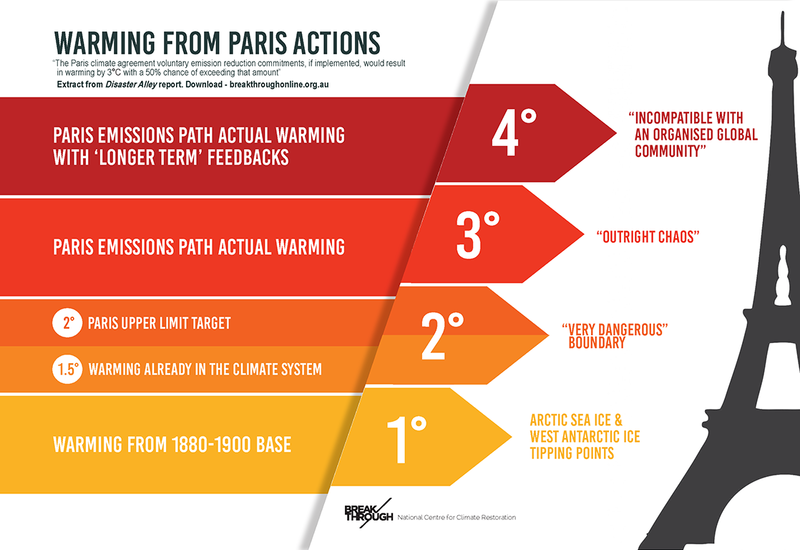 The Paris climate agreement voluntary emission reduction commitments, if implemented, would result in the planet warming by 3°C, with a 50% chance of exceeding that amount. So we are looking at a greater than one-in-two chance of either annihilating intelligent life, or permanently and drastically curtailing its potential development. Clearly these end-of-civilisation scenarios are not being considered even by risk-conscious leaders in politics and business, which is an epic failure of imagination. Of course, the world hopes to do a great deal better than Paris, but it may do far worse. A recent survey of 656 participants involved in international climate policy-making showed only half considered the Paris climate negotiations were useful, and 70% did not expect that the majority of countries would fulfill their promises. Human civilisation faces unacceptably high chances of being brought undone by climate change’s existential risks yet, extraordinarily, this conversation is rarely heard. The Global Challenges Foundation (GCF) says that despite scientific evidence that risks associated with tipping points “increase disproportionately as temperature increases from 1°C to 2°C, and become high above 3°C”, political negotiations have consistently disregarded the high-end scenarios that could lead to abrupt or irreversible climate change. In its Global Catastrophic Risks 2017 report, it concludes that “the world is currently completely unprepared to envisage, and even less deal with, the consequences of catastrophic climate change”. The scientific community has generally underestimated the likely rate of climate change impacts and costs. Intergovernmental Panel on Climate Change (IPCC) reports are years out of date upon publication. 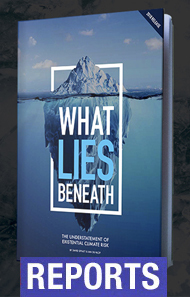 Sir Nicholas Stern wrote of the IPCC Fifth Assessment Report: “Essentially it reported on a body of literature that had systematically and grossly underestimated the risks [and costs] of unmanaged climate change”. “Our group found that, generally speaking, most scientific predictions in the overall arena of climate change over the last two decades, when compared with ultimate outcomes, have been consistently below what has actually transpired. There are perhaps many reasons for this tendency—an innate scientific caution, an incomplete data set, a tendency for scientists to steer away from controversy, persistent efforts by some to discredit climate “alarmists,” to name but a few”. Coral reefs: Just a decade or two ago, the general view in the literature was that the survival of coral systems would be threatened by 2°C warming. In 2009, research was published suggesting that preserving more than 10% of coral reefs worldwide would require limiting warming to below 1.5°C. The coral bleaching events of the last two years at just 1-1.2°C of warming indicate that coral reefs are now sliding into global-warming-driven terminal decline. Three-quarters of the Great Barrier Reef has been lost in the last three decades, with climate change a significant cause. Arctic sea ice: In 2007, the IPCC reported that late summer sea-ice was “projected to disappear almost completely towards the end of the 21st century”, even as it was collapsing in the northern summer of that year. In 2014, the IPCC had ice-free projections to 2100 for only the highest of four emissions scenarios. In reality, Arctic sea ice has already lost 70% of summer volume compared to just thirty years ago, and expectations are of sea-ice-free summer within a decade or two. Antarctica: In 2001, the IPCC projected no significant ice mass loss by 2100 and, in the 2014 report, said the contribution to sea level rise would “not exceed several tenths of a meter” by 2100. In reality, the Amundsen Sea of the West Antarctic Ice Sheet sector has been destabilised and ice retreat is unstoppable for the current climate state. It is likely that no further acceleration in climate change is necessary to trigger the collapse of the rest of the ice sheet, with some scientists suggesting a 3–5 metre sea-level rise within two centuries from West Antarctic melting. Sea levels: In the 2007 IPCC report, sea levels were projected to rise up to 0.59 metre by 2100. The figure was widely derided by researchers, including the head of NASA’s climate research as being far too conservative. By 2014, the IPCC’s figure was in the range 0.55 to 0.82 metre, but they included the caveat that “levels above the likely range cannot be reliably evaluated.” In reality, most scientists project a metre or more. The US Department of Defence uses scenarios of 1 and 2 metres for risk assessments, and the US National Oceanic and Atmospheric Administration provides an “extreme” scenario of 2.5 metres sea level rise by 2100.
a much more thorough exploration of the [high-end] tails of the distributions of physical variables such as sea level rise, temperature, and precipitation, where our scientific knowledge base is less complete, and where sophisticated climate models are less helpful. We need greater attention on the strength of uncertain processes and feedbacks in the physical climate system [...] (e.g., carbon cycle feedbacks, ice sheet dynamics), as well as on institutional and behavioral feedbacks associated with energy production and consumption, to determine scientifically plausible bounds on total warming and the overall behavior of the climate system. Accomplishing this will require synthesizing multiple lines of scientific evidence [...] , including simple and complex models, physical arguments, and paleoclimate data, as well as new modeling experiments to better explore the possibility of extreme scenarios. 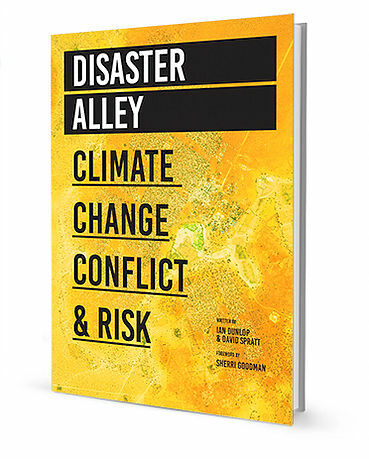 A prudent risk-management approach for safeguarding people and protecting their ways of life means a tough and objective look at the real risks to which we are exposed, including climate and conflict risks, and especially those “fat tail” events whose consequences are damaging beyond quantification, and which human civilization, as we know it, would be lucky to survive. We must understand the potential of, and plan for, the worst that can happen and be relieved if it doesn’t. If we focus on "middle of the road" outcomes, and ignore the "high-end" possibilities, we will probably end up with catastrophic outcomes that could have been avoided. It is not a question of whether we may suffer a failure of imagination. We already have. Yet people understand climate risks, even as political leaders wilfully underplay or ignore them. 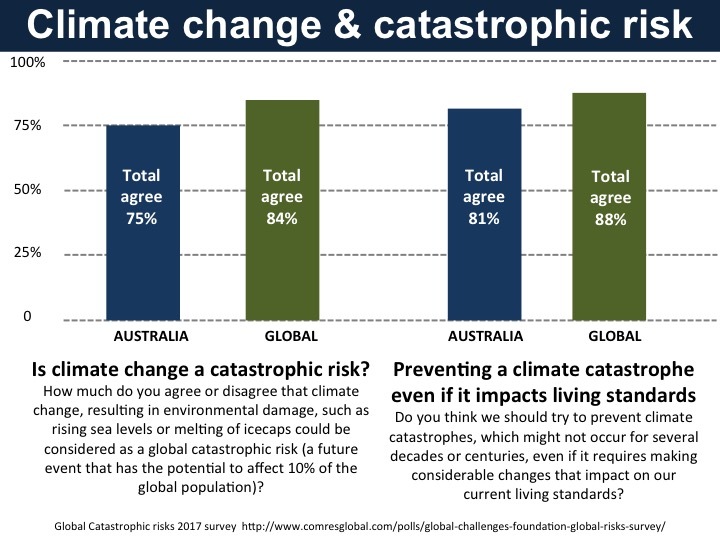 84% of 8000 people in eight countries recently surveyed for the Global Challenges Foundation consider climate change a “global catastrophic risk”. The figure for Australia was 75%. The GCF report found that many people now see climate change as a bigger threat than other concerns such as epidemics, population growth, weapons of mass destruction and the rise of artificial intelligence threats. GCF vice-president Mats Andersson says "there's certainly a huge gap between what people expect from politicians and what politicians are doing". 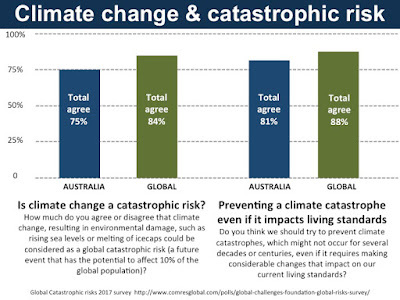 The same survey found 81% of the 1000 Australians polled agreed with the proposition: “Do you think we should try to prevent climate catastrophes, which might not occur for several decades or centuries, even if it requires making considerable changes that impact on our current living standards?”.